It’s Halloween month, which means it’s the best time of year to revel in all things spooky! Most of it is fun, but this post is a little more sobering. 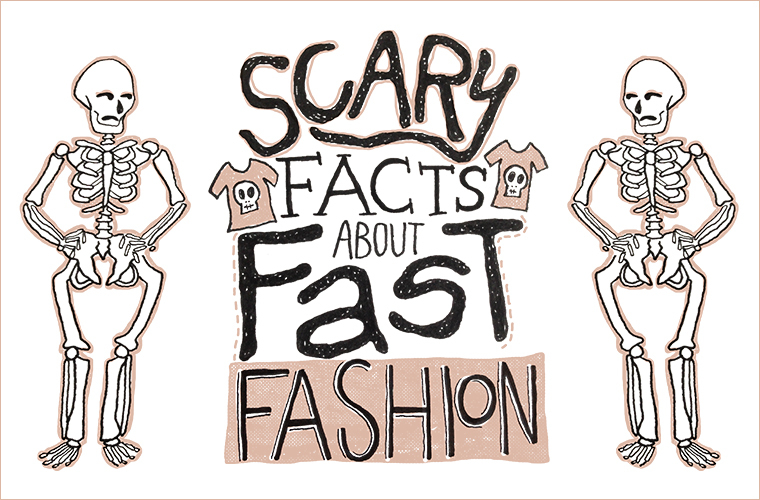 We have compiled a few fast fashion facts to keep you scared year ’round! We hope these fast fashion facts will help you learn a little bit about the sad effects of fast fashion and work to stop fast fashion in your own closet. Fast fashion is the fast-paced world of super trendy and cheap apparel. (Here’s a list of fast fashion brands.) These fast fashion brands aim to capitalize on today’s fashion trends by producing clothes as quickly as possible for as cheaply as they can. They rely on cutting costs by using cheap materials and cheap labor. Garment styles are designed to become obsolete and be replaced next season. Low quality goods combined with marketing encourages fast buying cycles: big fast fashion brands want you to want the hottest new thing. 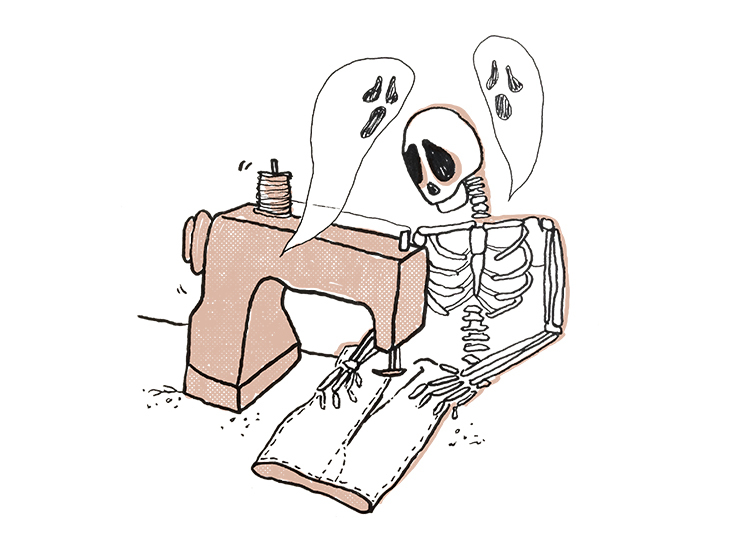 The way fast fashion apparel is made is downright scary. 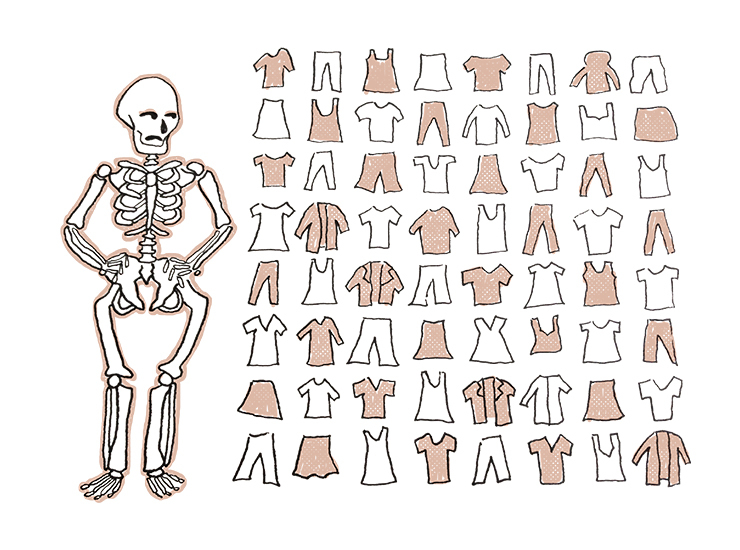 These scary fast fashion facts will keep you in the know and help spread the word. It’s time to stop fast fashion. Cheap materials and fast turnaround means there’s no time to deal with certified organic cotton. And non-organic cotton is thirsty. Not for blood, but water. Lots of it. Conventional cotton is the most pesticide-intensive crop grown on the planet. It uses approximately 3% of the world’s agricultural land, but consumes an estimated 16% of all insecticides – more than any other single crop. 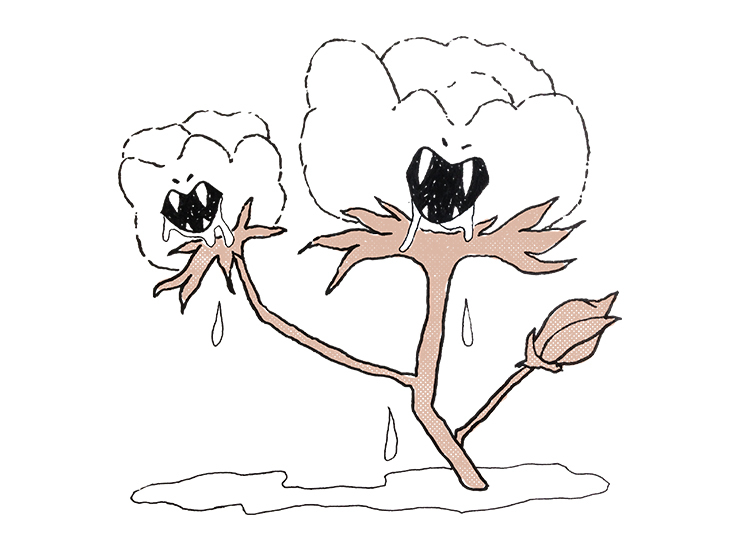 To grow 2.2 lbs (1 kg) of conventional cotton fiber requires 2,641 gallons of water (10,000 liters). It’s estimated that every non-organic cotton t-shirt requires around 713 gallons throughout the supply chain to produce. That’s the same amount of water the average person drinks in 3 years – talk about thirsty! Conventional cotton requires literally tons of fertilizers and pesticides to grow, but unfortunately all those toxic chemicals don’t affect just the plants. Cotton is grown in more than 100 countries and the cotton industry employs around 250 million people worldwide in the production stages alone. The average life expectancy of a non-organic cotton farmer in India is mid-30’s due to chemical exposure on the job. 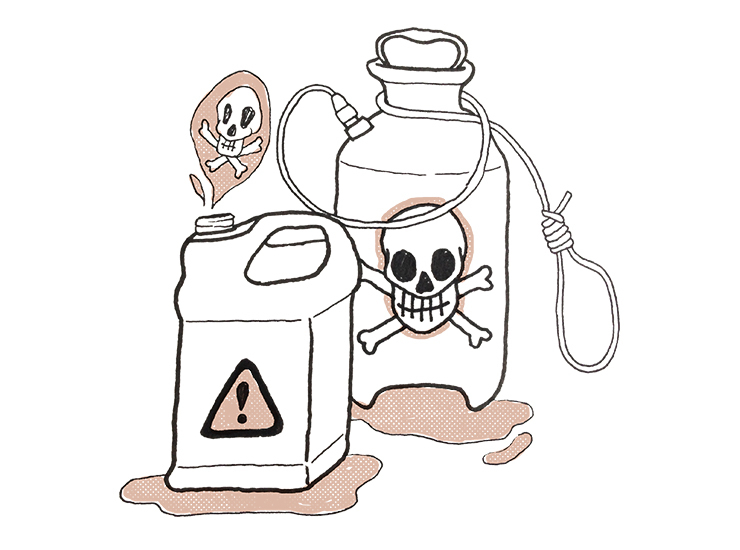 Between 26 million and 77 million agricultural workers suffer pesticide poisoning each year. Harmful pesticides also spread to workers’ families and children, neighboring residents of sprayed fields, local drinking water, and animals raised for food. The results can be deadly. You’ve heard of carbon dioxide (CO2) and how it affects our atmosphere – it’s not good. Meet its less common but more potent cousin, N2O. Nitrous oxide is a heat-trapping greenhouse gas and currently the single greatest ozone-depleting substance. Nitrous oxide is emitted when people add nitrogen to soil using synthetic fertilizers. In the 2015 crop year, U.S. farmers applied over 503 million pounds of nitrogen fertilizer to 8.6 million acres of cotton. Nitrous oxide is over 300 times more effective at trapping heat in the atmosphere than carbon dioxide, and has one of the longest atmosphere lifetimes of the greenhouse gases, lasting for up to 150 years. The majority of carbon dioxide in the atmosphere takes 20-200 years to dissolve into the ocean, but the rest can take thousands of years. Oh yeah, and excess nitrogen run-off from fertilizers can contaminate groundwater and streams. It’s a doozy. The super-low prices of fast fashions may seem like a treat, but we all know when something is too good to be true. So who’s really paying? There are roughly 40 million garment workers around the world today, and many face unsafe and unethical working conditions. Garment workers (85% of whom are women) deal with long hours, malnutrition due to low wages, unprotected exposure to toxic chemicals, sexual harassment, discrimination, forced overtime, and lack of job security. The legal minimum wage in most garment-producing countries is rarely enough for a worker to live on. In Bangladesh, minimum wage is only 18% of a monthly living wage. Concerned about staying competitive in the global market, governments in these countries have hesitated to set living wages for garment workers. Big fast fashion brands exploit poor countries to make a higher profit margin on their clothes: they cut costs by using cheap materials and cheap labor. All to make a buck. Ever feel like you’ve got a closet full of clothes but nothing to wear? That’s on purpose. Fast fashion brands put out new clothing styles every week, a strategy deliberately designed to make customers feel like the clothes you bought last week are already off-trend and it’s time to buy something new. Americans buy an average of 64 items of clothing per year (about 35 pounds’ worth). Compared to 15 years ago (around 2002), the average person buys 60% more clothing items and keeps them for half as long. Annually, the fashion industry produces about 14 items of clothing for every person on earth, and 60% of all clothing produced ends up in incinerators or landfills within 1 year of being made. How many clothes did you toss? Quickly made, briefly worn, readily tossed. Imagine a football field filled 14 feet deep with clothes. That’s how many clothes (13 trillion tons!) we send to landfills each year in the U.S. alone. Per person, it’s about 80 pounds. These clothes can sit in landfills for 200 years, leaching toxic chemicals and dyes that contaminate local soil and groundwater. Secondhand shops take in millions of pounds of donated clothing every year, but only about 10% of what they receive gets sold in their retail shops. Of the rest, about 50% gets recycled into cloth and fibers for commercial and industrial use. Nearly half of donated clothes get exported to other countries to be resold. But in the end, everything eventually finds its way to a landfill. Wow, those fast fashion facts were dreary! Unfortunately, sometimes the truth is a bummer. How about some good news? WHAT YOU CAN DO – Spread the word about these fast fashion facts! Choose organic cotton clothing over conventional when you buy new clothes. Organic cotton uses 91% less water to produce! Organic cotton that’s GOTS Certified means the fabric meets strict criteria regarding toxins and environmental and social impact. It’s better for everyone. Wash and dry responsibly. Laundering is the largest contributor to a garment’s greenhouse gas footprint – and that’s on you! Wash less often and use cold water. But most importantly, skip the dryer when you can and line dry instead. Buy Fair Trade. Check the label, read the description, and ask questions. Choose brands that sell Fair Trade and ethically-made clothing so you can be sure that the people who made your clothes work in safe conditions and were paid a living wage. Buy carefully. Buy only well-made garments that you love and can wear for years. Consumers generate a lot of waste by buying clothes on a whim and throwing them out a few months later. Extending the active lifetime of a garment by just 9 months reduces carbon, waste, and water footprints by around 20-30% each. WHAT WE DO AT SOUL FLOWER – working to stop fast fashion! We choose organic cotton. The organic cotton we use is GMO-free and GOTS Certified. Our blends are OCS Certified. We use only low-impact dyes. We choose Fair Trade and ethically-made. We have long-term relationships with vendors and suppliers and won’t work with anyone who dodges our questions about working conditions. We’re slow. Slow fashion is a good thing! Our line of Soul Flower apparel is mindfully-made. We screenprint everything by hand in our shop in Minnesota, and produce in small batches to reduce waste. We try to design long-lasting styles that can be worn for years, and we avoid fleeting fashion trends. We’re mindful. We’re a slow fashion clothing brand, and we act accordingly! We use repurposed and recycled packaging materials. We offset our carbon footprint. And when we can, we even snag waste fabric to make headbands. 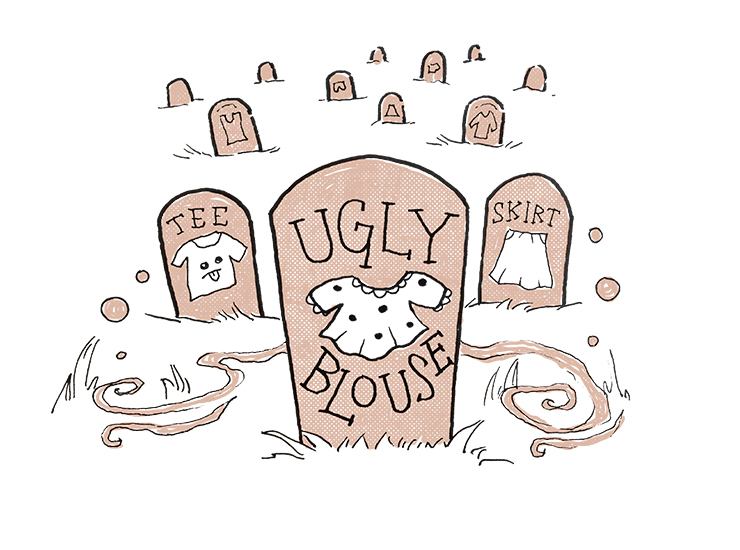 Fast fashion wants us to be mindless zombies in their scheme and buy, buy, buy. Making a difference starts with being mindful. So stick to your values and don’t get tricked – stop fast fashion. One garment at a time, we’ll make this world a little less scary. I love your Scary Facts about Fast Fashion and would like to use the article and pics in an exam for English Second Language in Quebec Canada. I am asking for permission to use this content, in a non-commercial, totally non-lucrative endeavour. Full attribution will be given to you and or your website/brand. Thank you. Please do, the more you can spread the word, the better!